Yune learns that you can't trust everybody. Ikoku Meiro no Croisée (Crossings in the Foreign Labyrinth) episode 5 covers a hard lesson for Yune. Claude wants to teach her something about freedom, but she learns how to distrust instead. 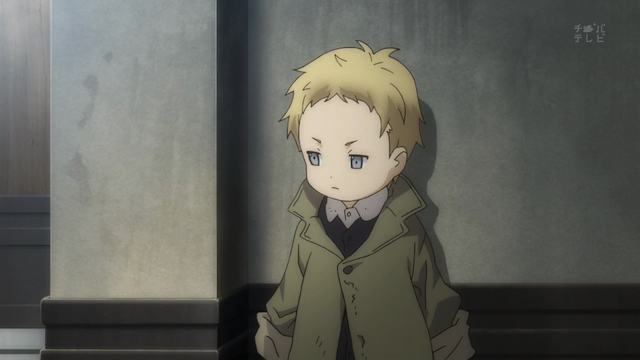 We also learn more about the poor boy we have seen already in several episodes. Beware of the handshake that hides the snake. Claude tries to encourage Yune to be more independent, and go out on her own, but she prefers to stay in the shop and work. I think he’s missing a couple of important points. First, women were not allowed much freedom at all in Japan at the time. She is unlikely to be accustomed to walking about on her own. Second, even the shop Claude works in likely still seems foreign to Yune. 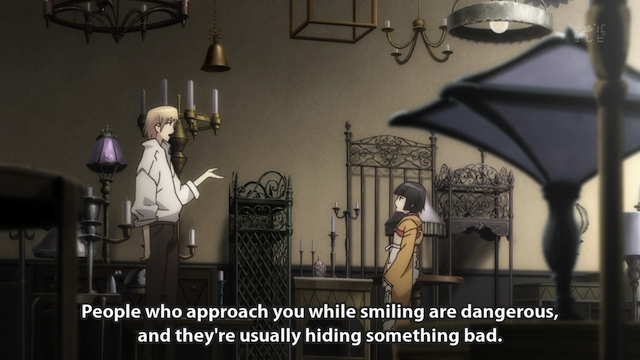 But Claude’s idea isn’t necessarily bad; Yune definitely needs some experience talking with other people. Yune is very open with people, and she expects that she can smile warmly and become friends with everybody. Of course, in a big city like Paris, you are more likely to be seeing strangers than friends or family, so some people are going to be suspicious if you appear over-friendly. 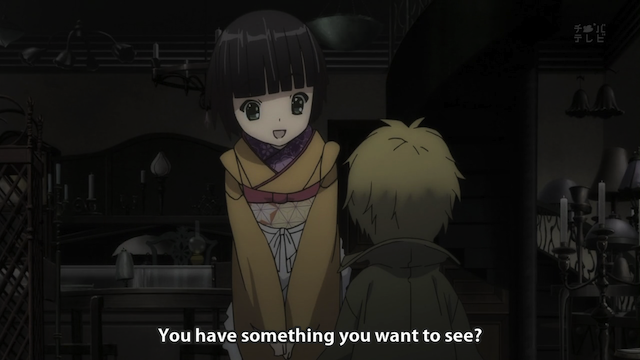 What Claude is clearly more concerned about, however, is that Yune is too gullible, and something bad can happen to her, because she is too trusting. Interesting use of the weather in this episode. It forces many people into the Galerie, and keeps Yune from leaving at a critical moment. We saw this young boy searching through a trash receptacle in an earlier episode. Yune forgets what Claude told her. The result? The little boy steals a candle holder from the window and runs. Note the strong diagonal of the ceiling meeting the wall, and generally unusual perspective -- we don't often look UP at Yune. When the poor boy comes to the shop, Yune is over-trusting, despite being warned, and is robbed. As you can see, her immediate reaction is confusion. This is conveyed in the screen shot above by the strong vertical and unusual perspective. It is almost what Scamp refers to as “Dutch Angle”. In a true Dutch Angle, the horizon line would be tilted, and here we have the illusion of that. 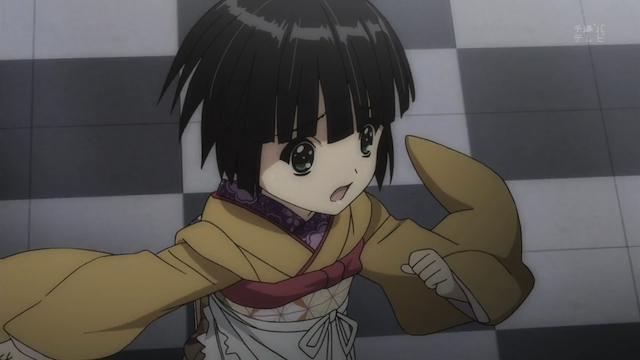 Unfortunately Yune heads out on her own to try to recover the stolen candle holder. Not only does she lose track of the thieving boy, she becomes lost in the Galerie. 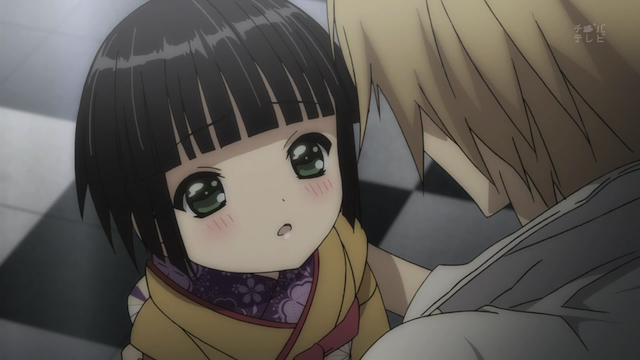 Yune is scared for a while, but Claude does eventually rescue her. She seems to be going in for a kiss, but ends up just holding his hand. So Yune learns a somewhat painful lesson about being too trusting. 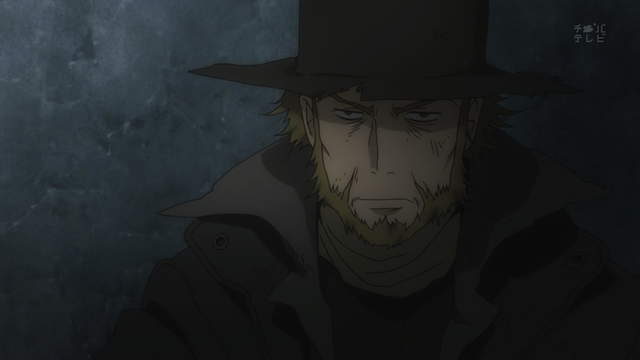 It also seemed that they were making the clearest indication that Claude and Yune were a pairing. Speaking of pairing: Oscar, Claude’s grandfather, is off spending the night with a lover. That old dude gets around! The Fencer. A second-hand merchandiser in a back alley. That the poor boy knows where to go to fence his goods, seems to indicate that he has done this before. All for a bit of copper. The boy exchanges the stolen candle holder for a few coins, and later we see him sitting in the dark, with a bit of bread, feeding a stray cat. 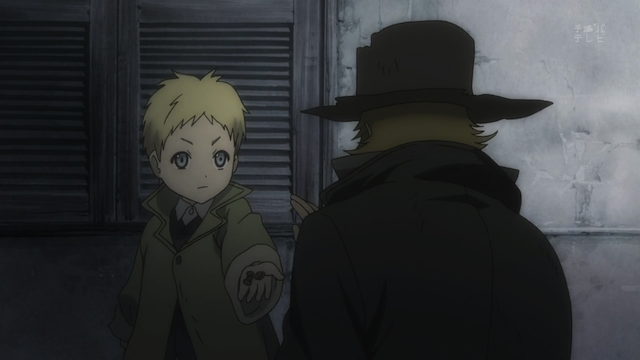 The boy might not be evil to his core; as Claude says, he doesn’t have the money to buy himself some bread, so he resorts to stealing. 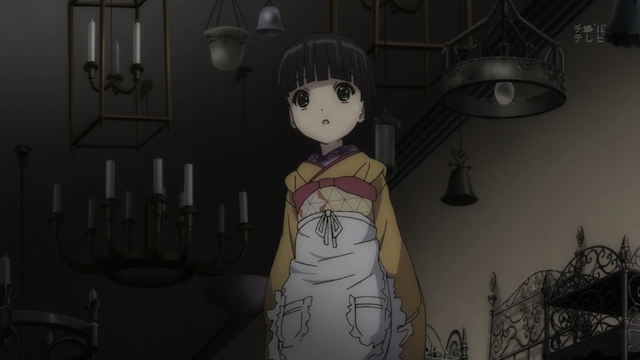 Yune was nearly devastated by the robbery, as she knows that the item was made, if not by Claude, then by his father or grandfather. Claude, however, stresses that he is relieved because there is nothing in his shop as valuable to him as she is. 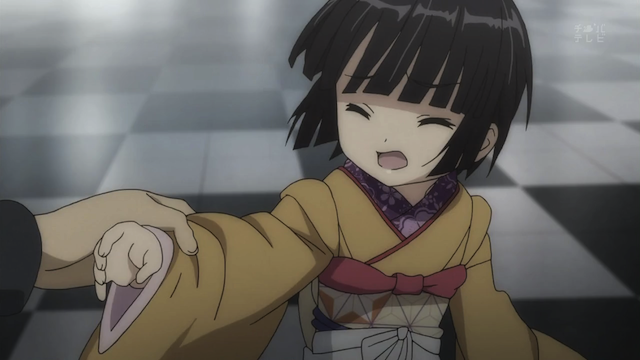 The contrast between the relationship Yune has and the one the boy has is profound. He doesn’t even get words from the old man, just a few coins. 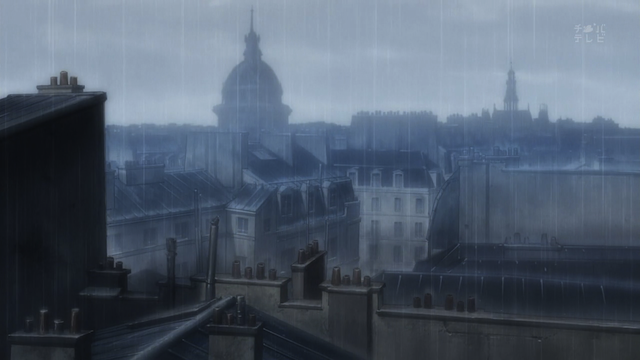 Even though Yune and Claude live in a very dark house, in comparison to Alice’s well-lit apartment of last week, the boy lives in complete darkness. He doesn’t have a single candle. 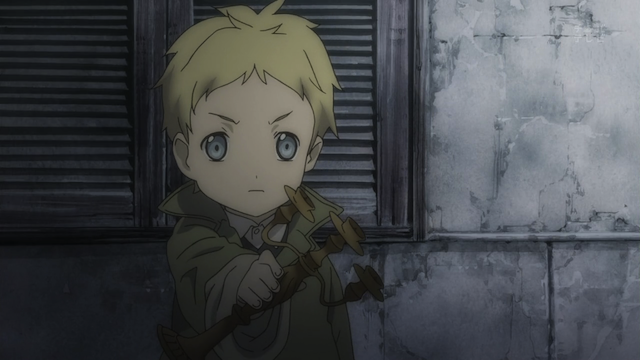 I don’t know if the young thief will return as a character or not. It is interesting that the show is opening the view to include not only the wealthy and privileged, as well as the humble craftsmen, but also the destitute, who live on the street. I kind of wonder if Oscar’s romantic adventures are going to play a larger role. He seems to be quite “active”, so I can certainly imagine them working in an episode that deals with some difficulty this will inadvertently cause. One last word: there seems to be an episode “4.5” that people are discussing. I haven’t seen a subbed copy, nor am I aware of its origin. If I find out more about it I’ll end up commenting upon it out of order.